As previously reported,The folks behind the Cafe on the Route in Baxter Springs will soon open a new restaurant in the Gryphon Building. The Gryphon building, also known as the Bagcraft Building, once housed Joplin’s bustling Inter-State Grocery Company. The proprietors of the new eatery are looking for old menus from Joplin’s past so that they can get ideas about possible menu items. If you have an old menu sitting around, be it from the Connor Hotel or Hidden Acres or another historic Joplin restaurant, that you would be willing to share, let us know. You can either comment here or send an email to our address under the About tab at the top. Thanks! There are two articles concerning history in the Joplin Globe this weekend. The first is a further update on the recently renovated Gryphon Building. Last week we referred to an article on the present status of the building and its progress in finding tenants. In that article, it was mentioned that a restaurant would be entering the building. This weekend brought more news along that front. Richard and Amy Sanell, owners of the successful Cafe on the Route over in Baxter Springs, will be the ones behind the Gryphon building restaurant. Of interest, Richard Sanell suggests that the menu might be based upon previous menus of downtown’s former great dining locations, the Connor hotel and the House of Lords. More info on the Sanells and their plans can be found in the article. The other article is a short write up by Joplin Museum Director, Brad Belk, on the dedication of Joplin High School in 1958. The article briefly covers the decisions behind building the new school, the funding measures that succeeded and failed, and the final result with some specifics, such as the number of bricks used in the school’s construction. We hope everyone had a great Thanksgiving weekend. Now back to the trenches! Joining the above mentioned is the Gryphon Business Development Center, Bourne Logistics, as well a restaurant which will serve lunch and dinner, and also have a bar. Purportedly, the restaurant will be run by a successful local area restaurateur. One of the key elements of saving Joplin’s historic buildings is making sure that they find that new life as homes to either people or businesses. So good news for the Gryphon building! Today’s Joplin Globe reported that the Joplin Museum and Historical Society boards met to discuss the Gryphon Building and Union Depot as potential locations for the Joplin Museum Complex. Both boards voted against a proposal to purchase the newly renovated Gryphon Building. The cost of the Gryphon Building was far too high for the museum. Joplin Museum Complex Director Brad Belk then discussed the Union Depot. After noting, “It is better laid out than the current museum location” he claimed the size of the depot is smaller than the current museum facility and that it has water issues in the basement. The depot is almost one hundred years old and has been sitting empty since the 1970s. With no windows, no doors, and no maintenance, it’s not surprising that it has a few issues. At least one architect and one contractor have expressed their opinion that the structure is sound and built to last. It seems Belk and the museum/society boards are dragging their feet when there is a golden opportunity before them. They could be heroes! Imagine – revitalizing the Union Depot, a beautiful structure that stands on the site of the lead strike that led to Joplin’s very existence – and helping anchor and rehabilitate north downtown Joplin. Instead, they are letting a few puddles of water and space concerns constrain them. Look into the water issue. Talk to architects about the cost and design of an addition to the current structure that would bring needed additional space that would, at the same time, preserve the architectural integrity of the depot. The Nelson-Atkins Museum in Kansas City managed to do this. Now, we realize that the museum complex is poor as a church mouse and that its board members are unable and/or unwilling to cough up a significant amount of funds needed to bring in a renown architect and build a modern addition like the Nelson-Atkins. That isn’t necessary. What is necessary is that the boards and Belk seize this opportunity. A local architect can be found who can create a tasteful and aesthetically pleasing addition. They have no concept of vision. But, then again, it seems that the museum and society boards are populated by good old boys who know very little about museums and historic preservation. Why not look into Mark Rohr’s proposals of grants and other funding methods to make the dream come true? It certainly would be better to try and fail in this case rather than just sit and do nothing but complain and grumble. In April the voters declined to support the museum’s pathetic takeover of Memorial Hall. Memorial Hall is over. Move on. Move on to what people are actually voicing support for. Museum attendance across the nation has been declining for years. Either you march into the future or you wait to be swept up into the dustbin of history and irrelevance. In memory of the feisty Joplin Globe and News-Herald editors of yesteryear who never failed to express their opinion whether popular or not. Don't Let The Museum Board Balk at A New Home! More news on other renovation projects going on in downtown Joplin from the Joplin Globe. First, we have the former Joplin Supply Company building at 228 S. Joplin Ave, where the renovation is proceeding under the ownership of a Kansas City developer, Donald Rosemann, and general contractor from Shawnee, Kansas, Straub Construction. The building will be rechristened the Ford Lofts and will offer 35 apartments, 7 of them single bedroom and the rest two bedroom. Rosemann believes that they’ll have high occupancy by completion next year. Part of the key is that the building will receive federal funding to offer reduced rents for affordable living. For bonus points, check out the comment section for the revelation that some individuals view “loft living” as an 8th deadly sin. Second, is a follow up on the status of the Gryphon Building at 1027 S. Main Street. The building, former home to the Interstate Grocers Association, will open in a few weeks with an expected 60% occupancy. The cost of the renovation was around $8,000,000 and the building will be leased by floor in stages. The first floor will feature “historic elements” that remain from the executive offices of the grocery company and provide restaurant and retail space; the third floor will have a “business incubator” that will feature 19 suites, with a “common reception area, conference room, kitchen and break room.” In the basement will be a gym, and the other floors will all be business space. Here are two links, one to the building’s facebook page and the other to the regular website for the building. 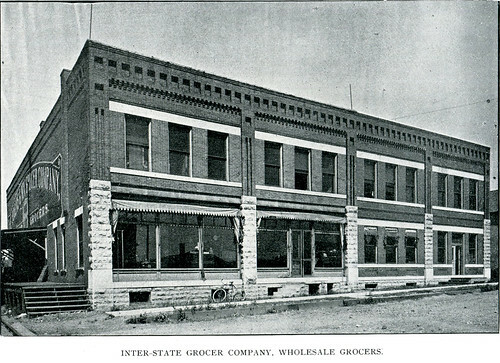 Here’s an earlier home of the Interstate Grocers.